Chess has been called "the Game of Kings" for good reason, since it teaches strategy within a hierarchical power structure. In the popular musical derived from the game, chess serves as a metaphor for the relationships between the characters and how they, like pawns and other traditional chess board pieces, are manipulated for political and personal gain by others more elevated in the hierarchy. 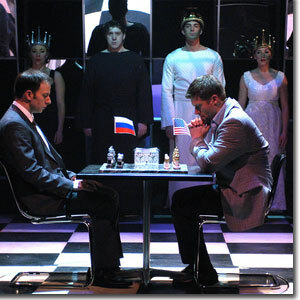 In the original version, which was actually a concept album, with music by Benny Andersson and Björn Ulvaeus (formerly of ABBA) and lyrics by Tim Rice, the central characters are two chess grandmasters, representing the United States (Freddie) and the Soviet Union (Anatoly) at the height of the Cold War. While the concept album and the original musical were big hits in the U.K. and Europe, the U.S. version had difficulties connecting with its audiences, partly because of changes made from the European version and partly because of the audience's ever-receding familiarity with the political climate that surrounds the story. 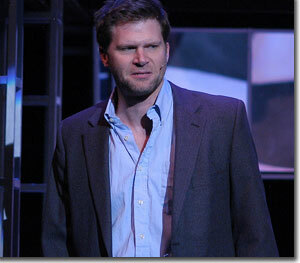 In a fortuitous chain-of-events, Arvada Center artistic director Rod Lansberry secured permission to rearrange and update the show, with the aim to strengthen the storyline and make it more relevant to the present-day global dynamics, while keeping intact almost the entirety of what continues to be one of the most respected scores in musical theatre. Lansberry notes, "Rice flat out says, 'If you want to move numbers, if you want to cut numbers, it's okay.' It's the first time I've ever come across someone who controls a show saying, you can change it. Usually it's, 'Don't change a word, don't do this, don't do that,' but he says they're still searching." So, essentially, in getting this chance to reconceive the show, Lansberry has the opportunity to solve a puzzle that has stumped many fine directors. His first order of business was to figure out which pieces were changed, which were added, and what order makes the most sense. "Right now," Lansberry said during our interview in January, "I'm using the original concept album, the American version, the UK version, and the Royal Albert Hall version, and what they (the producers) feel was the best concert version—the Swedish recording—which has pretty much everything in it." Additionally, Lansberry is pondering how to synthesize the geo-political realities of the early 21st Century with the mid-20th Century Cold War stalemate of the original story. "What I'm working on," he confides, "is to take a much more global approach. That's why I've changed some of the characters; I'm emphasizing some of the European global conflicts, bringing in Eastern versus Western Europe, the Middle East—all of those connections—and really looking at the chess game as a metaphor for who is in power and who controls the moves." While many folks look at the world and see chaos, there are others who see the world as a series of opportunities to be manipulated in their own interests or those of their country or their organization. If you think that sounds like a chess strategy, you're right, for that's exactly how Zbigniew Brzezinski—an advisor to Presidents Jimmy Carter, Ronald Reagan, and George H.W. Bush—describes it in his oft-cited 1998 work, The Grand Chessboard. Regardless of our individual political beliefs, Brzezinski's significant influence on U.S. foreign policy and national security matters begs for a more global and, at the same time, clandestine view of events, something which Lansberry is taking into account. As Lansberry explains, "I'm changing the character of the Arbiter. He's a good character, but as it was originally conceived, he was just the arbiter; yet, there's more there, like when he sings, "I know all the games, I know all the things you're going to pull / You can't get anything past me ..." So, I'm establishing him as a puppet master of sorts, the controlling factor who is making the moves and knows everything and everybody's background and secrets. "For example, the big number that everyone remembers is 'One Night in Bangkok,' which has been Freddie's number, yet to me it's never made any sense. So, I'm changing that to be the Arbiter's number and have him sing about decadence and what goes along with that." Lansberry's interpretation makes perfect sense to anyone who has studied the ways in which intelligence services and secret operations use personal weaknesses to entrap their targets. Those directly affected by the Arbiter's meddling include Freddie and his second (Florence), Anatoly and his second (Molokov, a KGB agent), as well as Florence's long lost father, Anatoly's estranged wife (Svetlana), and Walter (a CIA agent). "There is the question of how much the characters are being used as political pawns," Lansberry adds, "which is a perspective that I'm going to emphasize by showing how the Arbiter manipulates them. This allows me to move the musical numbers—which illuminate the characters' background and point-of-view—to strengthen the story; for example, where we learn why Freddie is spoiled or how Anatoly's life has been controlled." All this leaves us with a burning question: For whom is the Arbiter working? We'll leave that for you to ponder. 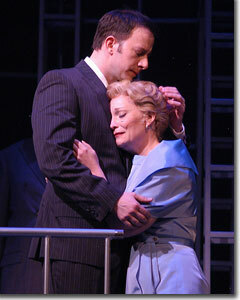 The Arvada Center's production of Chess, A Musical runs at the Arvada Center through April 15th. 720-898-7200 or www.arvadacenter.org.